Piet den Blanken (1951) is a wellknown Dutch photojournalist, whose pictures frequently appear in European magazines and newspapers. He has published photobooks on very diverse subjects. He followed the war in El Salvador (this summer he discovered what has happened to a one-armed Salvadorian kid-soldier whom he made sort-of-famous nine years ago). Furthermore Den Blanken pictured social life in small villages, people in prisons and country planning. Now he is working on a series on the new European borders. Check out his report on the German manhunters at the infamous Oder-Neisse border between Germany and Poland. Or have a look at his new pictures of the Ceuta-tragedy. Ceuta is the littleknown Spanish enclave in Marocco: the gateway (or better: the trap) - to Europa for innumerable Africans. Den Blanken is also present at The Eye of the Low Countries, the new comprehensive website for Dutch and Belgian photojournalists. 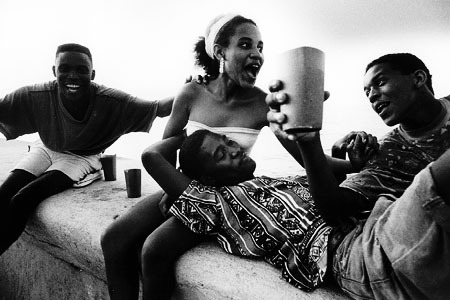 On this Cuba-page you find the pictures Piet den Blanken recently made on Cuba. He has been visiting this island many times. He knows his way around, he has friends there and he speaks the language fluently. Den Blanken is the kind of photographer who is able to capture the inside of a story. When you have seen these pictures, you know what Cuba is like nowadays. You don't have to read long articles. Just look at these photographs: look in the eyes of the people he portraits. Look at the men and women in the streets. Look at the people yelling at the match. Look at the woman with the sigar. Look at the machos and the girls. Look at the lonely old people. Look at Cuba. All pictures are in jpeg-format. © 1997 Rob Ruggenberg (homepage).